After the release earlier this week of “Translating a Noun into a Verb Pyongyang Style: The Case of North Korea’s New Cruise Missile,” both the author and 38 North were confronted by Chad O’Carroll of NK News via Facebook and Twitter about why the issue of video authenticity was not addressed in the article. This is our response. I will admit to being a little surprised by Chad O’Carroll’s commentary on my article noting the appearance of a Kh-35-like cruise missile in a DPRK propaganda film. It’s not clear what point he was trying to make—other than that Chad O’Carroll should be mentioned in any story about the Kh-35. In that case, he’s succeeded. Welcome to the party, Chad. Let’s invite some other people to join our party as well. I was not the first person to notice the existence of the documentary. It was the Chosun Ilbo that first reported a DPRK film existed showing a Kh-35. What I did was to find the film online, endure 49 minutes of often ludicrous propaganda, then spot a brief clip of the missile launch. Other colleagues who did exactly the same thing deserve credit for independently reaching the same conclusion (and enduring the same propaganda). I am happy to share the credit with Kyle Mizokami, Andrew Haggard and Stijn and Joost at the Oryx blog. That’s just in English. Although I didn’t know it at the time, one of the Chosun Ilbo’s reporters beat all of us with a very similar analysis in Korean. O’Carroll’s complaint seems to be that I don’t mention that North Korean propaganda should not be taken at face value. Well, fair enough. So, let me correct that by being explicit about something I thought went without saying: Folks, don’t believe everything you read or see. Sad news, I know, but nature and the sky probably did not unfold such mysterious ecstasy in celebration of the birthday of Kim Jong Il. Sorry kids. On Twitter, O’Carroll has gone further, arguing, with no evidence at all, that the cruise missile might be stock footage from Russia or elsewhere. It is, of course, possible that the North Koreans may have used stock footage. Short of exhausting every video of Kh-35 firings one might find, it would be impossible to exclude. By the way, Kyle Mizokami has been doing exactly that. Maybe Chad could give him a hand, rather than just making work for other people. The possibility that the film is stock footage, although possible, seems a very unlikely prospect—one that probably does not merit the several hundred words O’Carroll dedicates to it, nor the hundreds more my editors at 38 North have persuaded me to spill. But this is a chance to highlight lots of other interesting bits and pieces about North Korea’s Kh-35 that didn’t make it into the original article, as well as the excellent work of other people, so here goes. No one seriously disputes that North Korea is developing cruise missiles. The brief clip isn’t enough to invent a cruise missile program out of thin air. But it is interesting in light of all this other evidence. In recent years, however, rumors began to circulate of a new anti-ship cruise missile to follow the KN-01. In 2013, then-Lt. General James Kowalski stated that the United States intelligence community believed that North Korea was developing an anti-ship cruise missile called the KN-09. The designation KN-09 is a bit confusing. North Korea also has new generations of artillery, and some reporting suggests that the KN-09 is an artillery rocket not a cruise missile. It may be that new facts have come to light. But, whatever the correct designation, no one seriously doubts that the North Koreans are developing anti-ship cruise missiles that can be deployed with coastal batteries and at sea. North Korea is investing in a new generation of surface combatants, something that almost certainly requires anti-ship cruise missiles—since we don’t live in 1947. You might be able to machine-gun fishing boats, but better armaments are needed to justify trying to slug it out with heavily armed US, ROK and Japanese warships. As I noted in the original piece, Joseph S. Bermudez Jr. provided significant detail on North Korea’s new helicopter frigate for 38 North. Since normally one would expect such surface combatants to be armed with anti-ship cruise missiles, there was a lively discussion about what sort of cruise missiles we might expect. 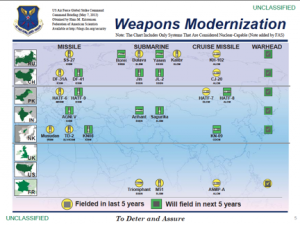 Most folks expected either Chinese or Iranian cruise missiles. There were other hints as well. In 2012, North Korea released a birthday documentary for Kim Jong Un. He is shown walking on one of the new surface combatants. Behind him is a rack for mounting cruise missiles canisters. This context is important. We’re not inventing a North Korean cruise missile or new surface combatants. We’re trying to understand what sort of cruise missile goes on these ships and what sort the North Koreans are testing. Something like the Kh-35 would be pretty interesting, since it’s a rather capable modern cruise missile that comes in both land-, sea- and helicopter-launched variants. That brings us to the video. There are two interesting shots—a wide-angle shot of the cruise missile being launched, as well as the close-up that shows the missile in flight. The wide-angle shot shows a very blurry surface combatant. The folks at Oryx Blog think it’s a North Korean Surface Effect Ship (SES), also known as the Nongo class by the US Department of Defense. I can’t tell myself. There are a number of oddities about the location of the canisters (seemingly forward on the ship) and their physical appearance. The forward firing position (which is more evident in the video) is unusual, and would seem to rule out many Russian and Vietnamese surface combatants. The Indians, on the other hand, do mount the Kh-35 forward. The close-up, however, suggests the canisters look rather different from the ones exported to India by Russia—the Russian tubes are not quite as smooth. (The Vietnamese tubes are smoother, but again, they tend to be mounted further back on surface combatants.) 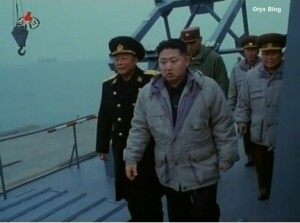 If it’s stock footage, I can’t find a better match for the ship and canisters than the DPRK. The close up of the launch also reveals a little detail that I didn’t mention. 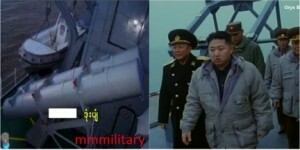 The nozzle of the DPRK version, as the Oryx Blog noted, would seem to be an indigenous innovation. I can’t find an open-source image of a Russian-produced version with that little nozzle, although it might be an undocumented Russian or Vietnamese alteration. For a long time, the presence of Kh-35s in Myanmar was thought to be evidence of a Russian sale. Other reports suggest that Vietnam might supply Kh-35s. The similarities in terms of the rack and canister, however, would seem to suggest that North Korea is the source of Myanmar’s Kh-35s. Why Myanmar would opt for a North Korean Kh-35 knock-off when it has much fancier Chinese C802 cruise missiles is a bit of a mystery to me. In context, then, the clips from the DPRK film are part of a larger puzzle about how and what sort of cruise missiles the DPRK is developing, testing and exporting. One might imagine that all these images and coincidences are an elaborate plot, but really that sort of thinking can get you tossed into the loony bin. Do you see the guy trying to stay out of the frame, then hiding behind the cameraman? That’s a doctor with a bag. He’s trying to hide because the North Koreans didn’t want to advertise that the Dear Leader was ready to stroke out at any moment. But there he is, dancing away. Oops. So, no, we should not take propaganda at face value. But let’s not completely disregard a pretty useful source of evidence, either. Evaluating propaganda critically means looking at the evidence in context, not inventing wild conspiracy theories that “might” explain away everything. Sometimes, a cruise missile is just a cruise missile. And this one happens to look like a Kh-35.